Shipments of crude oil by rail are expected to increase in the Bay Area and the rest of the state in the near future. BNSF Railways is already transporting crude oil into Richmond, including the kind of oil that exploded from a derailment and killed 47 people in a Quebec town last year. The new cars will patrol the main mountain routes into the state, Union Pacific officials said. Northern California sites will include Donner Pass, the Feather River Canyon and grades outside Dunsmuir. The state has designated all those areas high hazards for derailments. The Bee's Tony Bizjack spoke with Mina Kim about the program, which began last month. Bizjack explained that Union Pacific is particularly worried about California's mountain passes because they're considered more high-hazard areas, "often because they're curving, they're on slopes, and they have to deal with more extreme weather," he said. Bizjak rode on one of the track inspection vehicles. He said they're equipped with ultrasound to look into the rails to find weaknesses and lasers to measure variations in rail height and alignment. In the last five years, Union Pacific has had about 180 derailments in California, Bizjack said. "Derailments are surprisingly frequent, but generally very minor," he said. "Most of those derailments, however, the train cars ended up standing up, not falling over." About half of all derailments are caused by track problems, said Bizjack. Others are caused by human and equipments errors. "So tracks are important, that's sort of the front-line of defense -- PUC and FRA think -- in reducing the chance these new crude oil shipments can derail, explode." 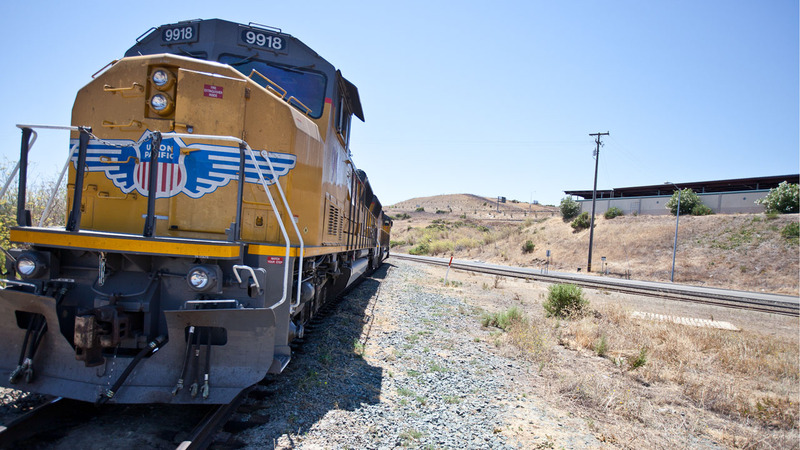 Union Pacific is not yet bringing volatile Bakken crude to California. But there are plans in the works for Union Pacific to bring crude oil both to and through the Bay Area, Bizjak explains. A project at the Valero refinery in Benicia would bring two 50-car trains a day through Sacramento and along the I-80 corridor. Another proposal in Santa Maria, by Phillips 66, would bring trains through Sacramento, the East Bay, San Jose and down the coast. "If you ask anybody in the Office of Emergency Services here in California, or first responders, fire departments, there is a real level of concern about the safety with more crude oil coming in," Bizjak said.